Agriculture originated independently in several regions within the last 12,000 years. The two earliest developments, in the Fertile Crescent region of Mesopotamia at the eastern end of the Mediterranean and in the Yellow River Valley in northern China (fig. 7.1), were to have the largest impact on early civilization. Agricultural discoveries began thousands of years later in other regions, including the Central American lowlands, the high terrain around the Peruvian Andes, and the tropics of Africa and New Guinea. The evidence that agriculture developed independently in these areas rests in part on their geographic separation but mainly on the fact that these areas all have different natural food sources, each of which required a distinct form of domestication. Studies of remote and isolated tribes who have maintained Stone Age cultures into the modern era have shown them to be world-class botanists within their own habitat. Most can distinguish hundreds to thousands of plants, an expertise rare among modern-day specialists in botany. Their motivation for acquiring this knowledge is obvious: they needed to gather food for survival, and they could not afford to make mistakes. Among edible items, it pays to know which are nutritious and good tasting, and which are not. It also pays to know which roots or nuts or berries or mushrooms are poisonous and which are not. I know a colleague who almost died when he made a wrong choice while foraging for mushrooms. These food choices made long ago were not trivial, and the Stone Age people of the Fertile Crescent region were certainly botanical experts. From at least two perspectives, the switch from the hunting-fishing-gathering life to agriculture was not inevitable. For one thing, hunter-gatherers derive food from many sources, and the wide variety of easily available plants and animals in regions like the Fertile Crescent naturally promoted nutritional balance. By comparison, overreliance on food sources from just one or two crops can cause malnutrition because of loss of sufficient protein or fat. From this perspective, it did not necessarily make sense for people to rely increasingly on just a few crops after 12,000 years ago. Studies have also shown that less energy is expended harvesting some wild grains in the Near East today than is cumulatively used in planting, tending, and harvesting their domesticated equivalents. We can assume that these early people were constantly making sensible, prioritized choices of how to get the most food in the least time and for the smallest expenditure of energy. 7.1. 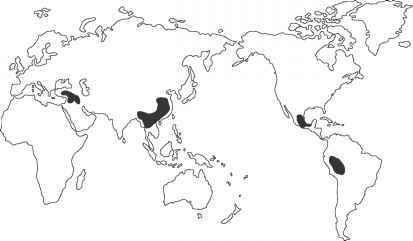 Agriculture originated independently in several areas shown in black, with the earliest known occurrences in the Fertile Crescent region of the Near East and in northern China. Even though the origin of agriculture was not inevitable, several factors caused people living in the Fertile Crescent to begin altering their daily routines in ways that would gradually develop into the practice of agriculture. Growing wild in the semi-arid grasslands of this region was an unusual variety of edible wild grains that were ideal for domestication (table 7.1). These included several kinds of cereals: two kinds of wheat (emmer and einkorn), barley, and rye, all of which are easily gathered sources of carbohydrate. Also available were peas and lentils (beans), both good sources of protein. This range of natural bounty was unique to this one region. Part of this bounty was a result of the semi-arid climate of the Near East. In regions with long dry seasons, where most of the annual vegetation dies each year, plants use their energy to produce seeds for reproduction, and those edible seeds are convenient food sources for humans. By comparison, the much larger amount of vegetation stored in well-watered forests provides little that is edible, and deserts are nearly barren. As a result, people in the Fertile Crescent could derive a portion of their food needs from crops but still augment their nutrition intake by gathering wild seeds, hunting, and in places fishing. With this combination of resources, they could avoid malnutrition. Because of this variety and natural abundance of wild foods, several technical innovations appeared early in this region (or were quickly adapted from elsewhere) by the time of the start of agriculture: primitive stone sickles with which to cut grain, woven baskets in which to carry it, and mortars and pestles for grinding it. And so a transition to agriculture gradually began to take hold in this region. At first, people picked wild grains and legumes because they were available, tasted good, and during a particular season were one ingredient among many sources of food. This was "gathering," not agriculture. But by 11,000 years ago, cereals related to wild varieties of grain began to appear well outside their natural distributions in areas like the Tigris-Euphrates floodplain as clear evidence of human intervention and manipulation. Very slowly, these preserved grains become larger than their original wild form, by as much as a factor of ten for crops like peas. People repeatedly picked the largest grains or vegetables because more food could be gathered in less time by doing so. This selection process was initially unconscious, simply a matter of common sense and efficient use of time, but it gradually produced results similar to what agricultural specialists have consciously done in recent centuries to develop improved strains of crops. Grains that were picked but uneaten would have been scattered around campsites or early farm villages. Some seeds would have passed intact through human digestive systems and ended up in nearby waste piles and garbage dumps. Some grains would have sprouted nearby during the next growing season in favorably moist and fertile locations, handy for use in that year's food supply. Slowly, people began to make these hand-selected wild grains a larger portion of their annual diet, and at some point they started to use sticks to poke holes in the ground to plant them, even though still heavily dependent on hunting and gathering for most of their food. The grains were easy to plant and grew to maturity quickly, usually within three months. Nearly 10,500 years ago, the first evidence of permanent settlements appeared, farm villages with populations in the hundreds. The earliest remains are mud-brick houses, surrounded by animal bones that indicate year-round butchering at the same location. These dwellings are direct evidence that people had largely made the conversion to farming, staying in one place to tend their fields and to watch over their food stores in winter. Slowly, over the centuries, humans and the grains they grew gradually became more interdependent. As people continually selected the largest seeds, their crops evolved into hybrids incapable of surviving in the wild against natural competition from other vegetation. Freed from the need to move constantly and carry their young, and with dependable food sources available, people could have children more frequently, and populations began to rise. 7.2. Plants that were first domesticated in the Fertile Crescent region of the Near East more than 10,000 years ago gradually appear in lake sediments across Europe in subsequent millennia. fortunate in having the wild predecessors of goats, sheep, pigs, and cattle. The hunter-gatherer technique of flushing and driving game in the wild probably evolved by degrees into herding of semiwild flocks and later to full domestication. 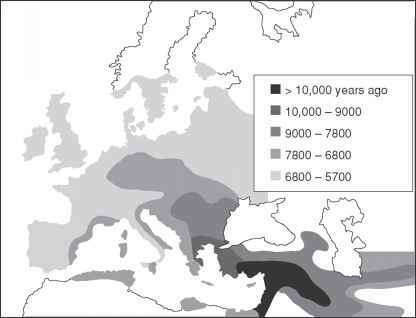 Gradually, knowledge of agriculture spread from the eastern Mediterranean (fig. 7.2). The earliest presence of agriculture in any region is marked by the first occurrence of domesticated cereal and legume grains in radiocarbon-dated lake sediments from regions where these plants did not grow in the wild. By 9,000 to 8,000 years ago, this Fertile Crescent package of crops had reached eastward into India and westward into modern-day Greece. By 7,000 years ago, it had spread southward into Egypt and Tunisia, westward into southern Italy and Spain, and northward into Europe as far as Germany. By 6,000 years ago, farming was present in all of Europe where it is practiced today. In a regional sense, the spread of agriculture was slow, but on a site-by-site basis the switch to agriculture was often rapid. With human help, cereals and other crops adapted to semi-arid climates of the Near East grew abundantly in the moisture-rich climate of Europe. Because wild cattle and pigs (boars) were plentiful in central and northern Europe, they became the primary kinds of domesticated livestock, rather than the goats and sheep common in southern Europe. Southeast Asia, the second major region where agriculture originated, spans a wide range of environments. In the cool, seasonally dry latitudes of northeastern China along the floodplain of the Yellow River and in the higher and more arid lands to the west, people grew two kinds of the grain millet. The earliest remains of these crops date to 9,500 years ago. Also found are the bones of domesticated chickens and pigs, as well as stone tools and pieces of pottery. In the warmer, wetter regions of tropical southern China and westward into Burma and Thailand, rice farming developed in a series of steps, beginning with the gathering of wild strains prior to 8,000 years ago, with intentional planting developing over the next two millennia. Because wild rice occurs only in uplands, the earliest rice farmers probably poked holes in relatively moist ground with sticks and planted grains. By 5,000 years ago, controlled irrigation of fields for rice growing had begun. Other agricultural regions were making similar advances. Between 9,000 and 8,000 years ago, the distinctive package of Fertile Crescent crops arrived in the Indus River valley of western India, and locally domesticated crops like cucumbers and sesame were added to the mix. Rice-farming techniques from Southeast Asia reached the Ganges Delta region of east-central India by about 3,000 years ago. Other people elsewhere in the world were also independently discovering agriculture. In the Americas, squash was grown almost 10,000 years ago, and avocados, beans, and corn by 9,000 to 7,500 years ago. Potatoes and tomatoes were also domesticated in the Americas. As the millennia passed, the impact of agriculture on people's lives continued to expand and diversify. Initially people grew fibrous plants like flax, cotton, and hemp for clothing, blankets, and rope. Later they obtained wool from sheep, goats, llama, and alpaca, leather from cattle, and silk from silkworms, and they grew bottle gourds in which to carry water. Beginning nearly 6,000 years ago, and continuing through Roman times, another important threshold in the impact of agriculture on humanity was reached. Agriculture and other innovations began to spur the growth of major civilizations, which in turn had a growing impact on the environment. One major innovation was in metallurgy. Humans in many regions were finally at the point of leaving behind the Stone Age tools they had used for over 2 million years. This process probably began in part with a simple observation around campfires: some of the rocks used to line the fire hearths contained small veins of shiny metals that melted at relatively low temperatures, ran out in liquid form onto the ground, and solidified when the fire weakened. In some regions, relatively pure veins of metal were readily apparent in rock outcrops. The obvious next step was to melt and refine copper and tin and later the alloy they created, thus initiating the Bronze Age 6,000 to 5,500 years ago in northern China. Further advances led to the start of the Iron Age by 3,300 years ago in southern China. Another important advance, the domestication of water buffalo and horses nearly 6,000 years ago, provided animals capable of pulling plows with much greater power than humans could possibly manage. With strong animals now harnessed to durable metal plows, the labor involved in farming was transformed, and ever-greater areas could be plowed and brought into production. Irrigation also became widespread during this interval. Small, primitive irrigation canals in the higher terrain of modern-day Turkey date back to 8,200 years ago, and the technique spread down into the Tigris-Euphrates River valleys between 7,300 and 5,700 years ago. Previously, farming in the generally arid lowlands near these rivers had depended on rivers flooding to just the right degree: enough to provide occasional water to nearby fields, but not so much as to inundate them for long intervals or erode the soil. Obviously, nature was not always so cooperative. Now, greater control of water meant that farmers were free from most of nature's whims. By 4,000 years ago, irrigation had come into wide use in rice-growing regions across Southeast Asia. Technological and agricultural innovations continued. The wheel, invented nearly 6,400 years ago in the region west of the Black Sea, spread through all of Eurasia by 5,000 years ago. By 5,500 years ago, people had learned how to plant cuttings or seeds and create orchards of olives, figs, dates, and grapes. 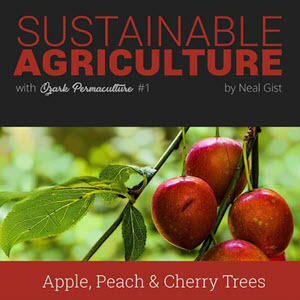 Later, using the more demanding technique of grafting, they planted orchards of apples, pears, cherries, and plums. Former "weeds" like oats, turnips, radishes, lettuce, beets, and leaks were domesticated and cultivated. By 2,000 years ago, virtually every major food crop we know today was under cultivation somewhere in the world. As a result of these innovations, food production increased enormously, as did population levels. A global population of a few millions or tens of millions at the start of the Bronze Age 6,000 years ago grew to 200 million by 2,000 years ago, the time of the Iron Age. Innovations in technology and plant cultivation permitted more and more people to be fed, and surpluses were stored away for lean years. In regions where food production and populations expanded earliest, advanced civilizations developed. The growing populations began to cluster first in villages, then in towns, and later in cities of increasing size. Complex social and political structures developed under centralized ruling power to manage large-scale irrigation projects and distribute food. Social stratification increased, with more marked distinctions between the affluent and the poor. Hereditary rulers used the power of taxation to provide for standing armies. The state also paid metal workers to improve technology and scribes to keep track of commercial transactions. Those who farmed part of the year under the direction of the state became available during the fallow season for projects under state direction, including the earliest construction of monumental architecture. Not by coincidence, the earliest civilizations arose in the same region of the Near East as the initial discovery of agriculture, beginning with the dynastic civilization of Sumeria nearly 5,000 years ago. Similar innovations and advances continued in China and Southeast Asia: soybean and pea farming; citrus fruit, peach, and apricot orchards; domestication of ducks and geese; tending of mulberry trees as habitat for silkworms; and development of the world's earliest Bronze Age and then Iron Age metallurgy. Soon after 6,000 years ago, local cultures in China began to coalesce into larger aggregates, with fortified towns appearing between 5,000 and 4,000 years ago. China was unified into dynastic states between 4,000 and 3,000 years ago. The appearance of monumental constructions (palaces, defensive walls, and canals) again indicates a surplus of labor from farming people during the fallow season. By 2,200 years ago, all of China was unified under the Zhou and then the Qin dynasties. In Egypt, a highly stratified society came into existence nearly 5,500 years ago. As the climate became extremely arid and the Nile River became a less reliable source of water because of the weakening monsoon (chapter 5), mechanical methods were developed to lift water to the nearby fields. Food-based wealth allowed construction of the great pyramids. Several millennia later, the engineers of the Roman Empire constructed buildings, aqueducts, and roads, many of which still stand today because of remarkably high-quality cement. By 4,500 years ago, advanced civilizations with populous cities developed in the floodplain of the Indus River and its tributaries. These people were skilled in making Bronze Age tools and traded products with their neighbors. They lived in homes made of kiln-fired brick along well-planned city streets with well-maintained drains. They developed a pictographic script and were skilled in sculpture and in sciences based on mathematics. Similar advances soon followed in east-central India along the Ganges River. China by 3,300 years ago. Long before free prose or poetry was written down, humans kept extensive records of the amount of food people produced or received, and the tools they were given for farming. Also recorded in varying degree were state functions, births and deaths, and astronomical events. The world's major religions came into existence during this interval. Some pretechnological societies had focused their spirituality on the animals they hunted, partly as an attempt to acquire the strength of the creatures they pursued, and partly to atone for the act of killing. Other early societies focused their devotion on the Sun and its seasonal motions through the sky. Life in these earlier times depended almost entirely on the Sun, in part for the warmth it provided, but mainly for the growing season it made possible. Farmers welcomed the slow rise of the Sun higher in the sky after the winter solstice, with its promise of a new planting season to come. Early solar observatories have been found on most continents, and priestly castes probably gained prestige from using them to forecast movements of the Sun and planting seasons. All the major religions of the modern era came into existence in the interval between 3,200 and 1,400 years ago. The Old Testament mainly relates events from the time of Moses nearly 3,200 years ago until the century before Christ. Most of the major religious figures of eastern Asia were born within a few decades: in 604 BC, Lao Tzu, the shadowy figure behind Taoism; in 570 BC, Sid-dartha Gautama the Buddha, born in Nepal near the northern border of India; and in 551 BC, Confucius, whose practical ethical precepts guided China into the early 1900s. Later, Christ's birth began the era by which the West marks its calendars, and Mohammed's birth followed in AD 570. According to Huston Smith (The World's Religions), some historians of religion link the relatively condensed timing of these religious awakenings to the social inequities and injustices produced by agricultural wealth. The founding figures of most religions showed deep ethical and moral concerns for the lives of people in general, but specifically for the plight of the disadvantaged in increasingly wealthy societies. This panorama of human ingenuity that developed in Eurasia (and elsewhere) after 6,000 years ago is truly astonishing, especially in comparison to those prior millions of years with so little change. But the agricultural innovations, the plants domesticated for crops, the trees and vines planted for orchards, the metal plows and axes, the domestication of oxen and horses, and the control of irrigation were producing other kinds of changes that scientists have only recently begun to examine closely. For the first time in human history, we were becoming a major factor in altering Earth's natural landscapes. Neil Roberts, in The Holocene, titled a chapter on the interval subsequent to 5,000 years ago "The Taming of Nature." Land had now become a resource to be exploited, and with this approach came the first serious environmental degradation from human actions. For the first time, human impacts were large in scale: cutting of forests to open the land to crops and pastures, erosion of hill slopes where deforestation and overgrazing destabilized soils, and influxes of eroded river silt and mud that clogged coastal deltas. The environmental impact of humans on the landscape in populous regions was growing. Changes were also underway in environments far from the wooded regions of southern Eurasia. People living in semi-arid climates began to adopt a different style of life as pastoral nomads, driving herds of domesticated animals in a continuing search for fresh grass. This way of life developed in the Central Asian steppes nearly 4,000 years ago. The vulnerability of these people to drought was later to play a role in the emergence of the Huns, Turks, and Mongols as some of the great invading warriors of history. In Arabia, and in Africa along the southern rim of the Sahara, camels became the means of conveyance for a different kind of nomad. In the Americas, a relatively early start in agriculture led to gradual but impressive progress. The domestication of corn (maize) was a strikingly successful example of slow plant selection by humans. Teosinte, corn's predecessor plant in the wild, had tiny ears (cobs) about an inch (2—3 cm) long. Slowly, over several thousand years, millions of decisions by individual farmers to select and plant kernels from the larger forms of this plant resulted in corn close to the size we eat today. Cotton, potatoes, peanuts, and several kinds of beans were also domesticated and cultivated in the Americas. The cumulative achievement of early Americans in ongoing plant selection for agriculture rivaled those in Eurasia. In the Americas, animals suited for domestication and harnessing were rare, some of the more promising candidates having been killed off in the extinctions nearly 12,500 years ago. Llama and alpaca were suitable for wool and occasionally as pack animals, but large draft animals like horses and oxen were not available. Still, after 3,000 years ago, large-scale clearance of forests for agriculture had occurred in the Yucatan Peninsula of Central America, where the monumental structures of the Mayan civilizations were later to rise. In this region, people double-cropped plants grown in raised fields among swampy lowlands. Recent investigations also confirm the presence of surprisingly large farming populations in the Amazon Basin just prior to the arrival of Europeans. Agriculture also got under way early and independently in Africa and in New Guinea, where tropical rain forests and savannas yielded millet, oil palm, sorghum, and peas. In the western South Pacific, the influence of southern Chinese agriculture and culture spread southward across much of Polynesia in two phases after 3,800 years ago, bringing breadfruit, yams, potatoes, taro, and bananas along with dogs, chickens, and pigs to these islands through a series of ambitious sea voyages. Technological progress relevant to agriculture (and eventually to industry) continued during the last 2,000 years. In China, coal was mined and used for fuel and cooking during the last 3,000 years. Water wheels were in wide use by Roman times, and the Romans also developed remarkably advanced techniques for making plaster and cement. By medieval times, 1,000 years ago, water mills and tidal mills were used for grinding grain and windmills for drawing water in much of Europe. Well before the industrial era, these sources of natural power drove mechanical devices in blast furnaces and textile production, and were used to saw wood. Most of the technological flow in the West during the millennium prior to AD 1500 was directed from more advanced Muslim countries to the less advanced European nations, although the Mongol invasions during the 1200s had destroyed much of the irrigation infrastructure in the regions of modern-day Iran and Iraq. The vulnerable semi-arid lands of the Near East also suffered far more environmental degradation than the better-watered and more resistant humid regions. In addition to erosion of uplands and siltation of river mouths, irrigation slowly increased the salt content of many agricultural areas in the Tigris-Euphrates valleys and elsewhere, until they had to be abandoned. Increasingly, technology was also being put to other purposes. Gunpowder was invented in China well before 2,000 years ago, although that country later turned away completely from its remarkable record of technological innovations after an internal power struggle in the 1400s. The Muslim nations developed their own explosives by AD 1100, and cannon by the 1340s. At least one of the major inventions of the last millennium was peaceful in intent: Gutenberg's printing press invented in 1455. It helped make possible the dissemination of knowledge during the Reformation and Renaissance of the Middle Ages. Well before the industrial era began in the late 1700s, humans had come a very long way from those first sporadic attempts to plant a few grains of wheat and barley some 12,000 years earlier. Within the last several thousand years, we had become a force capable of transforming the very look of the landscape. And, as the next three chapters will show, we had also become a factor in the operation of the climate system.